Venucia (啟辰/启辰) R50. 2012 to date (prod. n/a). 5-door sedan. F/F, 1598 cm³ (I4 DOHC). 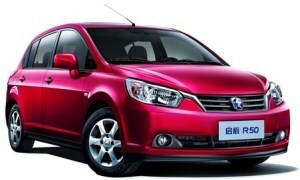 Nissan Tiida (C11) lives on, as second entry under the automaker’s new brand for China aimed at first-time buyers. Developed by Dongfeng Nissan Passenger Vehicle Company from Tiida base, on Renault Clio 3 platform.